The photo above is from Sandra Gal's new Web site, www.sandragal.com. 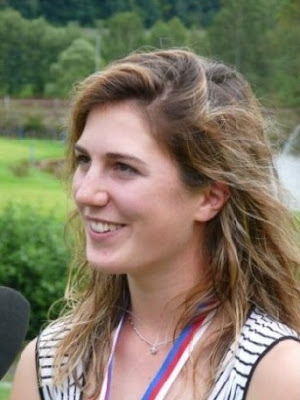 Gal is a native of Germany who is a rookie on the LPGA Tour in 2008. She played collegiately at the University of Florida, where she won four tournaments and was a two-time All-American in her three seasons there. In 2007, she was the No. 1-ranked European amateur. At the beginning of her senior season, she decided to enter the LPGA Qualifying Tournament, and zipped right through it, earning her full Tour card. So she wound up leaving school a year early, but does plan on finishing her degree in advertising. The 6-footer got off to a solid start in her rookie year, making the cut in her first three LPGA events with a best finish of 25th.